Anyone that’s been following my articles recently, knows that I’m a sucker when it comes to films. From the good ol’ golden oldies like Casablanca right through to modern offerings such as The Hobbit and Prometheus, I’m always eager to sink my teeth into a bit of cinematic joy. It’s this love of film that led me to the Glasgow Film Festival back at the beginning of the year, and it’s that same love of film that’s going to take me to the equally spectacular Sundance London at the end of the month. Yes, you heard me. The legendary Sundance Film Festival, no longer contents itself with simply being Stateside, returns for it’s London offering yet again. Now in it’s third year, Sundance London will be running from 25-27th April, and let me tell you right now – it will not disappoint. Combining an eclectic mix of music, independent films and a few classics returning to the big screen, it’s your one stop shop for a great weekend. Three great actors and a papier mache head, What more could we want? 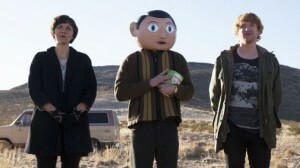 Heading up the line-up this year we have off-comedy Frank; an entertaining tale featuring comedian Chris Sievey’s beloved ‘Frank Sidebottom’, a giant papier-maché headed character. Frank is portrayed by the ever astonishing Michael Fassbender who stars alongside the equally talented Domhnall Gleeson and Maggie Gyllenhaal. If that doesn’t seem tempting enough, there’s also the international première of The Voices, starring Ryan Reynolds and Gemma Arterton, complete with film-maker Q&A post credits. The film centers around Jerry Hickfang, a lovable but disturbed factory worker who yearns for attention from a woman in accounting. When their relationship takes a sudden, murderous turn, Jerry’s evil talking cat and benevolent talking dog lead him down a fantastical path where he ultimately finds salvation. Still not convinced? Well, also on offer there’s the European première of The Trip to Italy starring Michael Winterbottom, Steve Coogan and Rob Brydon. Edited from the six episodes currently screening on the BBC, The Trip to Italy is a stand alone film and sequel to the acclaimed film and television series The Trip. Full of fun, food, snarky rivalry and oodles of laughs, it’s definitely something that won’t disappoint. 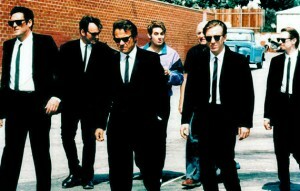 Reservoir dogs returns to the big screen. However, my personal favourite is the shorts programme that takes place every year. I think there’s a really under appreciated art in making short films and condensing so much purpose, plot and emotion into a short space of time. This year’s Sundance Film Festival short film competition winners will be on show and include: Love. Love. Love, Burger, Yearbook, I Think This Is the Closest to How the Footage Looked, The Cut, as well as the Short FIlm Grand Jury Prize winning Of God and Dogs. Still hankering for more? This year’s festival sees the return of Quentin Tarantino’s masterpiece, Reservoir Dogs, in case you missed it (or weren’t born) way back in ’92 at it’s original Sundance release. Or maybe you fancy checking out a spot of Guy Pearce, as he wows yet again in the 00’s psychological thriller Memento, brought to you by acclaimed director Christopher Nolan. Sundance is always going to jam packed with films, music and the downright amazing, and since the London arm of such a famous festival is still in it’s infancy, I think it’s only fair we all head down and experience this gem for ourselves and show it the support it deserves! For more info, tickets, and the complete programme of What’s On, check out Sundance London. New Trailer for Christopher Nolan’s ‘Interstellar’ Warps In!